According to Jim Marrs, William Torbitt, writer of the underground manuscript known as the Torbitt Document, or Nomenclature of an Assassination Cabal, was an attorney in Waco, Texas, whose real name was David Copeland and who, Marrs claims, told him in an interview that the information written under the alias had been given him by two federal employees, one with the Secret Service and the other with the FBI. We have also heard that Copeland was a prosecutor of criminals and may have learned details from men he represented who were connected to organized crime or hired as assassins. But was all this cover to protect the real source of the information? His first wife designed B-24 bombers in Fort Worth for Convair. It was this very plant where she worked during World War II, while she was married to Copeland, where Max Clark headed the security at the time he told George De Mohrenschildt that returned defector, Lee Harvey Oswald, was a "harmless lunatic." After his divorce from Wife No. 1, she married a former prisoner of war who had been held in Germany before war's end and then advanced to the rank of Lt. Col. in the Air Force during the cold war, stationed in German outposts. Wife No. 2 became a fashion designer/manufacturer for children's apparel and was often in Dallas, the center of the Texas cotton textile mart, which employed a number of "White Russians" known to have been somehow connected, if only collaterally, with the Kennedy assassination--people who were discussed in the Torbitt Document. "members of Dr. [B. H.] Carroll's church. Their residence is No. 1904 South Seventh street." Dr. Goddard was a medical doctor but in later years wrote an astronomy column for the newspaper in Waco. He also was county surveyor, in which he was succeeded by his son Joe Goddard. A Waco news article in 1955 reported on a family reunion held at the home of David Copeland's mother -- 425 University Avenue--close to the Baylor campus. David, already an attorney, and his wife Jayne then lived at 4217 Erath in Waco, some miles west of Baylor. David was a criminal defense attorney whose name sometimes appeared in the Waco paper owned by LBJ's close supporter Charles Marsh. She and the Goddard family were also the subject of a feature article written by Helen Baldwin that appeared in 1964. Copeland was campaign manager for Democratic nominee for state attorney general, Tom Moore from Waco, who was supported by former U.S. Senator Tom Connally, also from Waco. 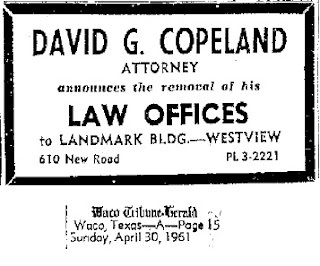 When Copeland ran for a place on the Texas Supreme Court in 1964, he was described as "a former Waco assistant district attorney, campaigner for Houston attorney Don Yarborough and a member of the Texas Association of Plaintiffs Attorneys." Four years later he opposed the favorite-son status of former governor John Connally, while leading the Texas campaign of anti-war candidate Eugene McCarthy. Aline Doris Campbell August 26, 1920 - October 22, 2010 Aline Doris Campbell of Alamo, formerly of Waco, passed away Friday, October 22, 2010 at St. Catherine Center. Graveside services will be 11:00 a.m, Nov. 13, at Waco Memorial Park. Aline was born August 26, 1920 in Brenham, Texas, the only child of Fred and Flora Buehrer. She graduated from Brenham High School in 1938. She attended Baylor University and graduated in 1942 with a Bachelor of Music Degree. To support the War effort, she worked in the design department of Consolidated Aircraft in Fort Worth, which produced the B-24 bombers. Following the war, she was a Registered Music Therapist at the VA Regional Medical Center in Waco and Director of Morale, Welfare and Recreation programs at James Connally AFB, Waco. She was preceded in death by her parents, Fred and Flora Buehrer of Brenham; her beloved son, David G. (Kippie) Copeland, Jr.; her late husband, Lawson D. Campbell; and her first husband, David G. Copeland. She is survived by her first cousin, Franklin Raschke and wife, Genevieve, of San Antonio; niece, Kathy Copeland Papke of Austin; nephew, Randy Copeland of Houston; cousin, John Toland and wife, Deborah, of Tucson, AZ; cousin, Nancy Fontaine Woods of Braddford, England; and cousin, John Barrett of Austin. Memorials may be made to the Wounded Warriors Project. Aline's grandfathers were Swiss and German, though both men married Americans. Air Force Plant 4 was opened in 1941. 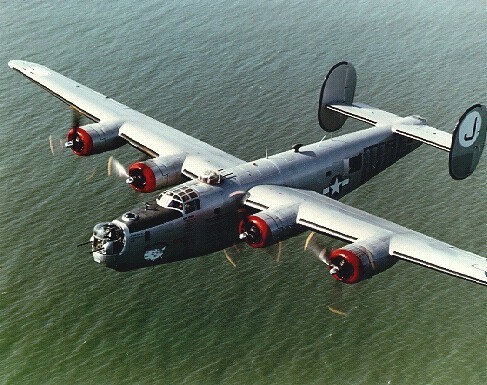 It was operated by the Fort Worth Division of Consolidated Aircraft Company (later Convair) for assembly of the B-24 bomber. 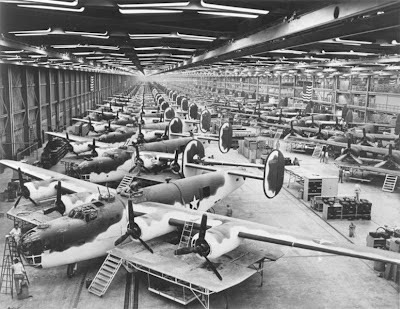 In 1942, during World War II, Air Force Plant 4 became operational when Consolidated Aircraft began manufacturing the B-24 Liberator bomber. 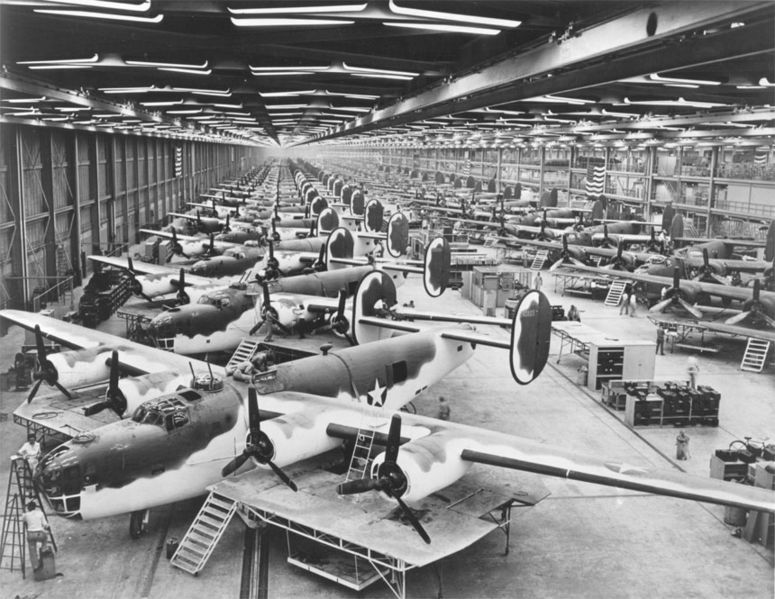 Over 3,000 B-24s were constructed in the first 2 years of operation. Later, the plant produced 124 B-32s, the successor to the B-24. Later, the plant began producing aircraft components, as well as delivering completed aircraft. Many innovative aircraft were produced at AFP 4, including the first intercontinental bomber (B-361, the first supersonic bomber (B-58), and the first swing-wing aircraft (F-111). In 1953, General Dynamics took over operation of the manufacturing facility. Since then, Air Force Plant 4 has produced the B-36, B-58, F-111 and F-16 aircraft. Between 1947 and 1954, 383 B-36s were built, and afterwards the Mach-2-capable B-58. By 1966, the plant had expanded to 4.7 million square feet, and by 1968 it had expanded further to 6.5 million square feet, to accommodate production of the F-111. Married Capt. Lawson Campbell, 610st [sic] Communications Officer, in Kassel in 1959 and went to live with him in the States. 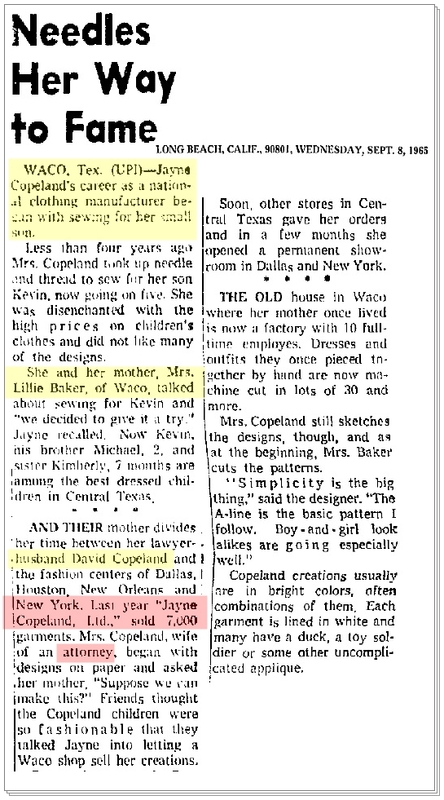 Copeland's second wife, Jayne Baker Copeland, would get into the news when she started her own clothing manufacturing company several years before Kennedy's assassination. "General Manager for Barber Boats and Motors in Dallas, Texas. Following a long and successful tenure at Barber Boats, Milton retired with his wife, Jayne Baker Solomon, to the city of his birth and his circle of cherished friends." "She partnered with her daughter and only child Jayne in the design and manufacturing of the Jayne Copeland line of children’s wear. She later opened and operated Lillie’s Bridal and Formals on South 8th Street where customers fondly regarded her as 'Miss Lillie.' She retired at age 80 after 25 years in the bridal business to devote her time to her great-grandchildren. Lillie is survived by her daughter Jayne Solomon and son-in-law Milton Solomon, grandchildren Kevin Copeland, Michael Copeland and Kasey Frederick. She leaves four adored great-grandchildren: Jessica Steakley, David Copeland, Kristin Copeland and Max Pfeiffer-Frederick, as well as brothers Robert, Eldridge, and Charles Blain." From this information about Lillie's surviving siblings we learn that Lillie Mae Blain had married William Judson Baker, who died in 1950. Jayne's name was listed in Texas birth records as Evelyn Jane Baker. In 1930 the Waco directory listed W. Judson Baker and wife Lillie living with his parents, two brothers and two sisters, at 1912 Franklin Avenue. Judson and Lillie worked at an ice cream stand, which sold "frozen custard." Four years later the couple lived at 1000 S. 8th Street, and his parents lived on the same street a few blocks to the east, an address now within the Baylor campus. Before his in 1950 at age 40, Jayne's father, Judson Baker, was a used car dealer in Waco who had started a Christmas "fling," in 1946 by throwing dimes off the roof of his office to the scores of children below. In 1947 he switched to pennies, throwing 40,000 off his roof. The Jayne Copeland line of clothing continues, as does the widespread fame of William Torbitt's document. Thank you for your pst at "Deep Politics Forum", I thought that I was the only member there who believed "Torbitt" was a quality addition to JFK researchers.